Suncity Radio has emerged winner of the media house category as best radio station for promoting tourism at the 12th Brong Ahafo Regional Tourism Awards Night 2017 held at the Eusbett International Conference Center in Sunyani over the weekend. The awards ceremony which was on the theme, “Promoting Responsible Tourism” saw people from different destinations coming together. The Brong Ahafo Acting Regional Manager of Tourism, Joseph Appiaagyei in his welcome address said in recent times service delivery as far as the hospitality industry was concerned has improved tremendously in the region. He explained that the awards night creates an opportunity for sector organizations in the hospitality and tourism industry as well as individuals to be rewarded for various roles played. He bemoaned the poor nature of roads in the region especially the Sunyani-Techiman stretch hence appealed to the Brong Ahafo Regional Minister to channel through government to help put the road in good to attract investors in the region. Mr Appiahagyei said the region is endowed with a lot of resources and tourists attractions and as such much work needed to be done to improve upon undeveloped tourists sites. 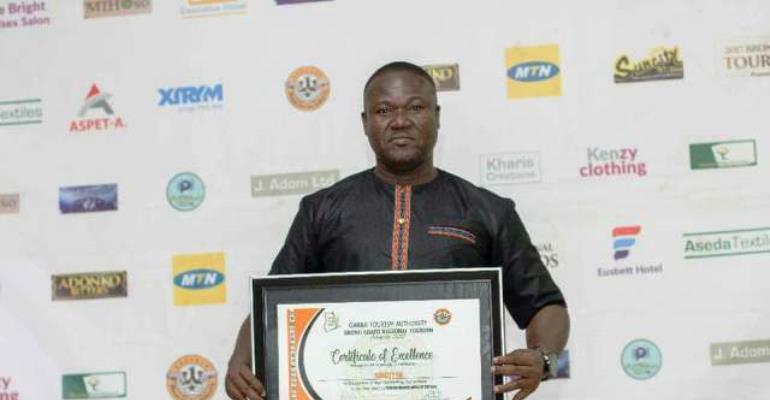 Meanwhile, among other awards was the best tourism program of the year “Ghana Today” by Radio BAR while the tourism writer of the year went to Mr Emmanuel Adu Gyamera of Graphic Communications Limited. Others were tourist attraction sites guard of the year, Adamu Amidu of Fulla Falls. In the hotel categories, Eusbett Hotel emerged the best services and three-star hotel of the year, soon to be elevated to a four-star status. One Star Hotel of the year went to Villacom Boutique Hotel and the newcomer hotel of the year was Zeniel Oasis Hotel at Goaso. Some honorary awards were also given to distinguished personalities who have supported the promotion of tourism in the region. Mr Ransford Antwi, CEO of Suncity Radio, Sir Colonel Samuel Bennett, CEO of Eusbett Hotel and Nana Apenteng Gyabour, CEO of ENCOM Hotel in Techiman, all received citations.